When you first install the Player.me desktop app, you may notice that it launches on startup by default. You can see this by checking the programs running in your taskbar, at the bottom of your screen. Right-click the Player.me app&apos;s icon and you&apos;ll see this menu. 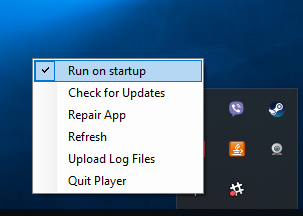 Click on Run on startup to disable that. The next time your computer boots up, it will no longer start with the Player.me app running in the background.